This is a DVD of the 'Screaming Eagles' of the 101st Airborne Division, one of only two American parachute infantry divisions used in the invasion of France on June 6th 1944. This Invasion of Normandy film shows the actions of the men of the 101st Airborne Division as recorded by the 165th and 166th Signal Photo Companies, during the historic operation of the Normandy landings that started on D-Day, 6 June 1944. Combat Reels has researched and compiled all of this raw combat film footage, then reformatted it into the DVD format for your viewing pleasure. 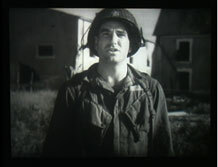 6/6/2012: This is a new-re-release of our popular 101st AB Normandy DVD. We have added 30 minutes of newly discovered footage to this movie film. There are even some scenes in color and some sound recording. The military history footage in this video is intended to be strictly that of the 101st Airborne Division and only shows other unit footage when two or more units are intertwined. This video begins June 5th, the day before the invasion, as the 101st completes its final preparations in England until the time that the Division returned to England in mid July 1944, after a successful deployment. All of the Parachute Infantry Regiments, Glider Infantry, and Engineers are represented. 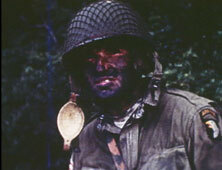 All of the Parachute Infantry Regiments and as well the Glider Infantry and Engineers are represented on this film. Included are soldiers of the 101st loading their planes and gliders, helping each other check equipment, securing loads underneath the planes, their actions after landing in France, and much more. See General Eisenhower visits the 101st just prior to their departure for the invasion. Then the first few days of the invasion are covered in places like the "Stopka Strongpoint", Ingouf Farm, and others as German POWs are processed and mixed units reorganize. See mixed units of the 82nd and 101st hold towns like St. Mere Eglise and St. Marcouf. Images are shown of many wounded soldiers being taken to the 128th Evacuation Hospital and cared for by medics. The key town of Carentan is represented extensively, as the men of the 101st capture and hold the town, and then celebrate with the liberated French residents. A ceremony is held in Carentan to award men of the 101st Airborne with Silver Stars for gallantry in action including General Maxwell Taylor. The video ends with interviews and recorded audio of several officers as they tell of their actions in Normandy. Order your copy today and enjoy these and many more up close shots of equipment, vehicles, weapons, uniforms, helmet markings, and of the faces of the men of the 101st Airborne Division themselves on these candid movie film reels of history, presented to you on popular DVD formatted video! Watch a short clip / movie of troopers of the 502nd PIR as they enter and walk the streets of Carentan. Ike visits the 101st before they load up for the D-Day jump. A couple troopers walk to their plane. A Trooper ready to assault festung europa. Lt. Colonel Robert Cole discusses his role in the action at Carentan. Jake McNiece paints the face of another airborne pathfinder of the Filthy 13. 506th PIR men are transported across the English Channel. 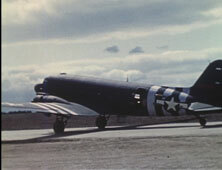 C-47 with its invasion stripes. 502nd PIR troopers in the early days of the invasion.